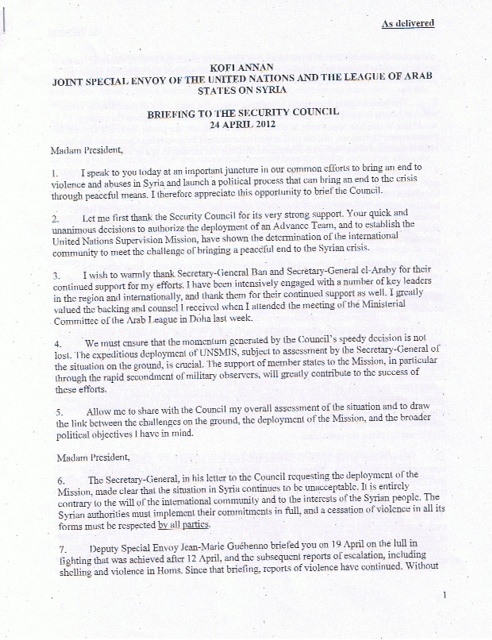 UNITED NATIONS, April 24, updated -- In five pages and 33 numbered paragraphs Syria envoy Kofi Annan briefed the UN Security Council Tuesday afternoon; copies of his briefing were made available to many journalists at once, sourced to a "Security Council diplomat." Update 4:58 pm: meanwhile another Council diplomat told Inner City Press that in consultations, the Department of Peacekeeping Operations estimated it would have 100 observers in Syria in one month's time. Some asked, at that rate the 300 won't be hit until three month or the 90 day (initial?) mandate of the Mission. Update 5:28 pm: Ambassador Churkin of Russia came out an the report above, that DPKO said could only deploy 100 observers in one month. Inner City Press views of another Permanent member's Permanent Representative, more soon. There were many on the one hand, on the other hand echoes in Annan's briefing. He cited "Homs, where violence has dropped significantly in response to presence of a very small number of observers." But he also said he was "particularly alarmed by reports that government troops entered Hama yesterday... killing a significant number of people." So what did Annan do? He told the Council, "Two observers have been stationed in Hama today." As Inner City Press reported, Norwegian General Robert Mood went into the Security Council minutres before Annan's briefing began; the UN has declined for two days running to state whether Mood is being paid by the UN at this point. 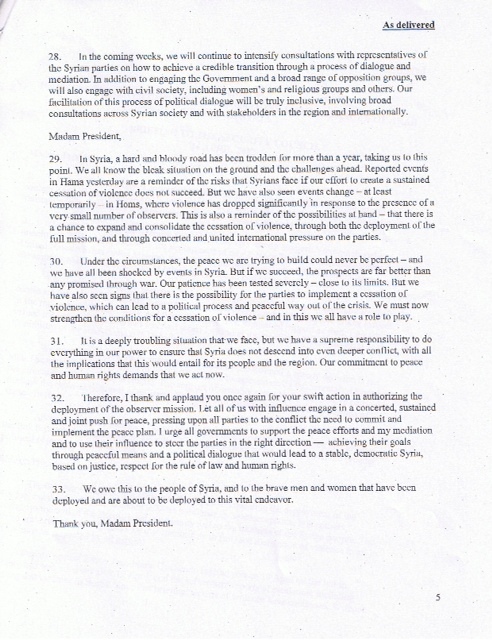 On the political process, Annan told the Council he "will request the President of Syria to appoint an empowered interlocutor." 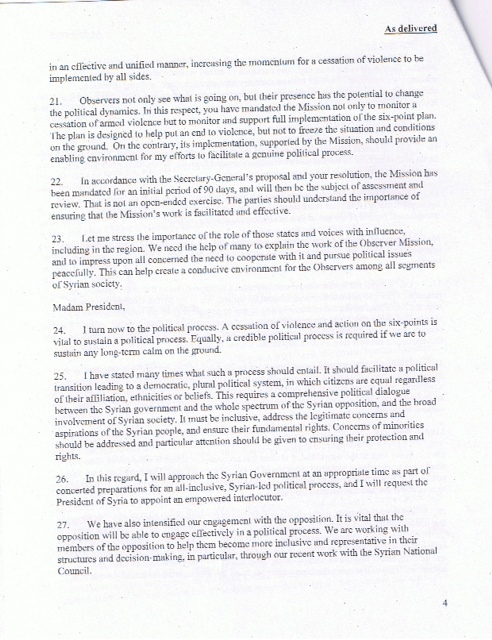 That is an interlocutor on reform -- possibly Prime Minister Adel Safar -- not a replacement for Bashar al Assad in power. Annan said "the Mission has been mandated for an initial period of 90 days and will then be the subject of assessment and review." Ambassador Susan Rice said on April 21 that "we will not wait 90 days to pursue measures against the Syrian government if it continues to violate its obligations." Footnote: As the Annan briefing continues, Sudan's top two UN diplomats arrived, followed by another UN envoy Haile Menkerios. The Sudans were the topic of the briefing to follow Annan's, seemingly of lesser interest despite the drums of inter-state war. Another Norwegian, Hilde Johnson, was slated to brief, from Juba where it would be midnight. We will cover this too.